I was wondering Trader Joe's and I saw these donuts for the first time. I'm not sure if they are a new product or if I just hadn't noticed them before but into my basket they went. All you do is leave the amount of mini donuts you want in a sitting out for about 30 minutes and then microwave them for about 30 seconds. What you get after that is a warn and sweet smelling teeny, tiny jelly filled donuts. The other part of the donut looks lightly fried. The insides are soft and a little greasy. There is not really much flavor to the pastry. It's not bad but it is just sort of there. 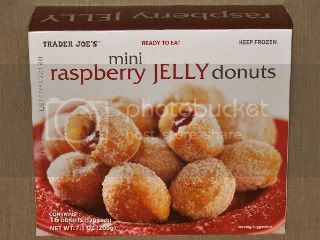 The jelly I liked, there is not much jelly in the donuts but whats there is nice and sour- which is how I prefer my jelly/jam and it does taste like real raspberry, rather then something that is raspberry flavored. Over all these weren't the most outstanding of Trader Joe's offerings but it was interesting and worth trying. I actually found these things quite excellent. I believe that they are made in Europe and they taste like they come from a European bakery. As you say, they are not overly sweet, which I appreciate. The balance of jam filling and granulated sugar coating is just right. I do recommend to be careful microwaving them as the package suggests -- it's way too easy to over do it.